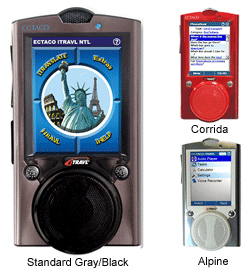 Absolutely unique in the world of hand held language and travel assistants, this translator includes everything the business or leisure traveler needs to make visiting foreign destinations an enjoyable and easily navigated experience. * A pre-recorded English word list provides access to the dictionarys spoken English entries. Just say the word and it will find it. * Amazing Language Teacher and U-Learn Car Tutor systems to help you learn a foreign language in the time it takes to fly to your destination. * A brand new Video Players support the widest range of video (.asf (h2 64), .flv, .mpeg4, .h.263, .divx, .mjpeg) and image formats so you can watch on the go. * jetBook Reader displays and translates your favorite eBooks so reading can be done anywhere and anytime. Loaded with a full range of the most useful communication tools. By simply speaking into the translator, you can have your phrases instantly translated and spoken aloud using a sophisticated combination of speech recognition modules, real human voice output and speech synthesis. Helping you to enjoy sightseeing more, meet new friends and deal with emergencies, it is loaded with a full range of the most advanced language management tools ever combined and includes iHELP which lets you immediately access a list of emergency or most frequently used phrases instantly. Thanks to its remarkable Speech Recognition modules all you have to do is pronounce a voice tag and it will speak the phrase immediately. A real life saver! An intuitive point-and-say talking 39 Language Picture Dictionary with pronunciation for all words has also been included to extend the functionality of your translator for supreme value and convenience. Lost? Never Again. Equipped with the CIA World Factbook, all the destination information you need is now in the palm of your hand. The Audio PhraseBook makes asking for directions easier than ever before and the inclusion Cultural Notes on modern Arab-Islamic traditions provide detailed information you wont find anywhere else. No more books or papers! Now you can leave it all at home, greatly reducing the time and energy necessary to access the information you depend on most while traveling. A pre-loaded jetBook Reader even lets you read and translate your favorite e-Books with support for the widest array of file formats available anywhere. Before and after your trip you can also use the built-in speech enabled Language Teacher and the unique U-Learn" Car Tutor that lets you study hands-free and eyes-free to make use of every spare moment to improve your speech and accent. A pre-recorded word list even provides access to all the dictionaries spoken English entries. Designed specifically to help you understand and learn English, Spanish, French, German, Italian, Polish, Portuguese, Arabic, Chinese, Farsi, Japanese, Russian and Korean, you can also use it to communicate with your non-English speaking housekeeper or construction workers, to impress your visiting business partners with your knowledge of their language or to show your friends and family how much you know. Speaking another language has never been easier or more fun! The Best of the Best! Easy to navigate and user-friendly it offers a hi-resolution touch-screen interface that puts Windows CE powered convenience at your fingertips. A customizable interface offers you a choice of display languages and a responsive virtual keyboard for each of the included languages makes entering text quick and easy. In addition, the built-in Audio and Video Players support .avi, .mp3, .wma, .wav, .ogg, .jpg and .png audio, video, and image formats so you can access your favorite media files anytime, anywhere. Whether you're on the go or ready to study, this global travel companion is always at your side. With the inclusion of a convenient metric and size converter and a talking calculator, you can now verify exchange rates and have them pronounced instantly. In addition, a world clock is now accessible so you can check the time in any time zone just by clicking the location on a virtual map. Once you take a trip with your new Translator, you'll never leave home without it! * Hangman game, linguistic crossword, notepad, calculator, metric and size converter, and word time clock utilities.